I’m a huge believer in coincidence – not during a murder investigation or while uncovering a spy-ring of course – but generally during normal life, coincidence plays an important part in what happens to us. I was shown a prime example of it a few months ago while I was walking on Skiddaw. I’ve been poorly – I’m stuck in the house with a bad foot, not able to walk, so I’ve been looking back through last year’s photos and reminiscing. We didn’t have many great Saturday’s last year (I walk on a Saturday, so it’s those days that stick in my mind), but the day I climbed Skiddaw, for the most part, was absolutely cracking. Several weeks earlier I’d broken one of the loops on my pack. 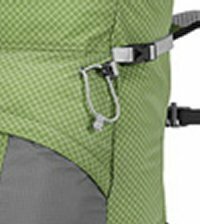 The GoLite Jam has two loops on the back to allow you to attach walking poles, ice axes, hats or whatever to the pack. These are thin bungee loops that clip onto plastic hooks on the pack. I’d been using mine to attach my walking pole and over time the pole had worn the loop all the way through. It snapped eventually and I resigned myself to only having one loop from now on. I mean, how does one replace a 6 inch length of quite thin bungee cord? The cord has to be thin enough to pass through an eyelet in the pack and thick enough to do the job that’s intended. So I was absolutely astonished, and pleased, to find the exact item I needed, on the path just shy of the summit of Skiddaw. It was just lying there on the path. It’s a small item and the chance of me stumbling across it was minute. The chance of me finding the item when I actually needed it was even more remote! But there it was, on the path. It looked brand new too. It even had the little gripper thing, like the ones on the Jam do. I could have hunted on-line for a month and never found a suitable replacement and yet here it was on the path in front of me. A great walk, enhanced by the finding of a little jem! 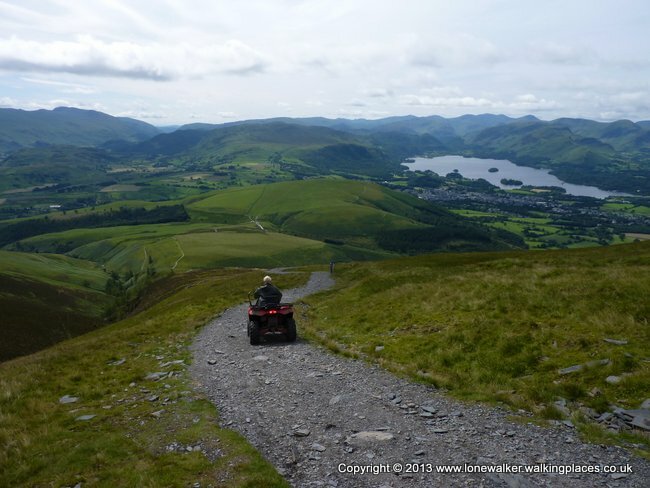 The best way to descend Skiddaw! On the way back down I also encountered that other ethereal force of the universe, Karma. The sun had slipped behind the growing banks of cloud and I slipped my sunglasses through a ring on my pack. They’d be fine there until I got back to the car I thought. Now I love my sunglasses, I’ve had these Ray Bans for almost 10 years and they’re superb. You can’t buy them any more either. I stopped for a crafty pee, beside the path on the way down, I had to walk slightly away from the path to avoid being spotted and I dropped my pack as I sat on a wall and waited for a gap in the traffic. Duty done, I proceeded down to the car, where I found I’d lost my sunglasses!! They must have slipped out of the ring on my pack when I dropped it. So, you win some, you lose some – what goes around comes around – swings and roundabouts. I lost a £110 pair of beloved shades and found a 10p sliver of bungee cord. But it was a great walk!